June 15, 2017 (Tokyo, Japan) - Japan Display Inc. (JDI) today announced development of an integrated console display for automotive applications, suitable for and easy to incorporate into interior vehicle designs. This Pixel EyesTM display features seamless cover glass and integrated peripheral touch controls around the display. JDI will start sample delivery in December, 2017. In this 10.2-inch Pixel EyesTM product, a single IC controls both the active area touch functions and the peripheral touch controls around the display. This makes it possible to integrate automobile controls for air conditioning, radios, etc. into the display cover glass, making it easier to seamlessly integrate the input system into the cockpit design. Pixel EyesTM products incorporate JDI's proprietary technology which integrates touch functionality into the display. Pixel EyesTM products are already used in many smartphones, and will expand into automotive applications with their ability to: 1) realize high touch sensitivity under various operating environments, including glove use, and 2) reduce optical reflections to improve visibility. In recent years, automobile displays have been widely used for car navigation, instrument panel, entertainment, and even rear- and side-view mirrors. Also, many control functions and switches are required throughout the cockpit. When multiple displays are installed, there are many times when it becomes difficult to arrange them inside the car, and interior design freedom may be compromised. 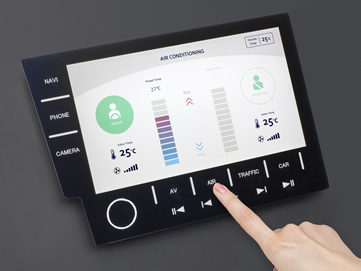 To address this problem, this newly-developed product allows for a seamless cover glass design that integrates both front console display functions and surrounding touch controls. In the future, JDI plans to expand this concept to curved automotive displays as well. JDI will strive to continuously develop and propose user-friendly displays for future autonomous vehicles.